Written by Greg Tormofrom interviews conducted with Harold Thomas and Robert Wrightsil. So many soul and R&B groups over the years made one or two promising records only to fall by the wayside shortly thereafter. Often bitterly disillusioned with the music business and rarely having any money to show for their efforts even if their releases made an impact on the Billboard or Cashbox charts. The pages of soul music's history book can be written chapter after chapter with tales of hopeful singers and groups whose contributions consist of a handfull (or less) of good, yet doomed-to-be-obscure releases for tiny independent labels. The most long-lived and successful groups, those who forged entire careers out of their raw talent, are relatively few. The Four Tops, the Temptations, the Dells, and the O'Jays are probably the most well known. All of these groups were lucky enough to be with strong record companies that promoted their product and they all deservedly achieved the great success that their formidable talents, perseverance and determination warranted. Some of these groups, most notably the Temptations, were rife with internal conflicts, altercating egos whose struggles spawned both inspired solo careers as well as vindictive lawsuits. Others like the Four Tops and the Dells have been able to sustain themselves as cohesive units without resorting to messy break-ups, so strong is the bond between the members. But how many groups have lasted as long as any of these groups without the chart success and the financial renumeration that is so necessary to warrant staying with a singing career year after year? A single artist might be able to keep a full time job and sing in a small club every week without ever becoming a household name, but how do 3 or 4 or even 5 men rationalize staying together for 30 or 35 years while remaining hidden from the general public in the shadow of obscurity? This was exactly the question I began asking myself after I managed to get in touch with one member of a group whose records I owned and enjoyed. I didn't have everything they ever cut, nor did I know how many records they'd ever made. I didn't even know if the group was still together or whether any of them were still alive. All I knew at the time was that I had a handfull of great singles and that most likely they had cut a few more that I didn't own but would like to hear. I had always enjoyed playing their records (and I still do) and I was curious to find out more about them. 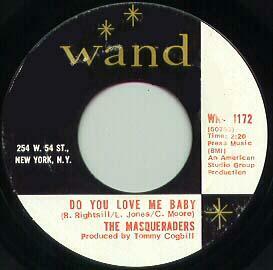 The group in question is truly a soul fan's dream - the Masqueraders. As I spoke with them, I realized that their history is one of hope, determination, hard work, and perseverance. They released enough records to make collecting their output a whole hobby in itself. 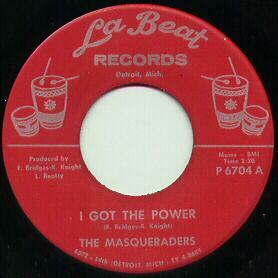 At least 25 documented singles and 3 LP's, with many more tracks recorded but never released. What makes collecting their records so much fun is that some are quite easy to find thanks to good distribution and relatively good sales when they were initially released; some are not so easy to find, and a few are nearly impossible to locate because so few copies were pressed. You can easily stumble on some of their greatest records while browsing through a box of old R&B records and you can spend years searching in vain for others that are just as good, if not better. There are releases on their own labels, and there are releases on tiny independents, mid-sized and major labels too. 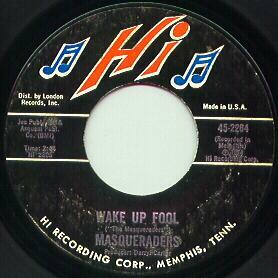 They recorded in Dallas, in Detroit, in Memphis and in Atlanta. Their sound grew more mature as their career went on, they recorded sweet ballads and smoldering deep soul as well as Motown-inspired uptempo dancers. This group was definitely not some fly-by-night aggregation of no-talent wannabees. To release so many records, they had to have talent. Talent recognized by each label owner who signed them, including some of the big names in the business like Willie Mitchell and Isaac Hayes, not to mention the producers who wanted to work with them but could not due to contractual obligations (more about this later). Robert Wrightsil and Charlie Moore formed a singing group in the 8th grade at TC Haskell School in Dallas, Texas in 1958. They called themselves the Stairs and the line-up consisted of Charlie Moore on lead vocals, Robert Wrightsil singing tenor, brothers Johnny and Lawrence Davis singing 2nd and 3rd tenor and "Little" Charlie Gibson singing bass. In fact, "Little" Charlie was so little, the group had him stand on a case of Coca Cola during their performances. Details on the Stairs' recordings are a little sketchy at this time, but it appears that they released at least one single which was a cover of "Flossie Mae", originally by the Saucers, and an original compostion intriguingly entitled "Caveman love". The Stairs were together for 2 years until Lawrence and Johnny left the group and Little Charlie went into the Army. At this time, the remaining pair began to recruit some more members, which included Willie Charles Gray who later joined Les Watson and the Panthers and eventually embarked on a solo career which yielded some singles. After a few personnel changes, Lee Jones, Harold Thomas and David Sanders were added to the line-up. They had previously been in their own separate groups at another Dallas high school. Highland Park was where the rich people lived. Well there was a talent competition there every week and the band that would play behind us was a group of rich white kids. Well, this band wasn't just our backing band, they were also our competition! They would play behind us and then they would play on their own. And we still tied with them for 3 or 4 weeks in a row. We were all underage and we never got paid or anything, but the parents of these rich kids would get a beer truck for the weekend and we'd all drink beer for free. It was a lot of fun. But we were good! We rehearsed every single day for 7 years straight. We used to walk and sing at the same time. The group also performed in small towns around Texas that were normally deprived of touring groups and they took it upon themselves to be booked as the Drifters or whatever group was hot at the time. 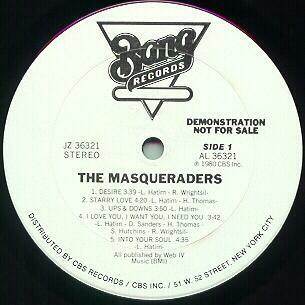 Because they could sound like any group they set out to emulate, they eventually found a new name for themselves and thus the Masqueraders were born. The clever twist of phrase sounds much better of course when you actually hear it sung in gospel-tinged call and response manner, with the group's doo-wop influenced ooohs complementing Lee Jones' lead. The offical A-side "Talk about a woman" sounds much like a Curtis Mayfield number (think of a Sam Gooden-led early Impressions track) and that the group were fans of his style comes through clearly. When the Soultown release made no noise in Dallas, the group decided to make a trip to Detroit, home of Motown. The year was 1966. Alvin Howard arranged an audition for them at Hitsville on West Grand Blvd so they saved up all their money - enough for a one-way plane ticket for each member. When they arrived, at Motown in Detroit, they were disappointed to find out that the producer they were supposed to audition with, Mickey Stevenson, was nowhere to be found. He had left Detroit to set up his own label on the West Coast. Instead, they auditioned for James Dean who told them that Motown already had a Temptations and didn't need another five man group. Between the five of them, they only had $15 left and could not afford to get back to Dallas. So they thought they would try to stay in Detroit to raise enough cash to sustain themselves until they could fly home. Having heard of the Twenty Grand Club, they figured if they could get there, they could ask to sing and maybe make a little money. First, though, they needed to find an inexpensive hotel room for the night, and they wound up at the cheapest place they could find - the YMCA. Robert told me that two of the group went in to pay the minimum possible and then the rest sneaked into the room. Their next dilemma was actually finding the club itself and they simply started walking along the street, asking strangers how to get there. On their way down 14th Street in Detroit, they came upon a 2 story house with a large picture window. In the window was a microphone. One of them suggested it looked like it might be a recording studio and they approached the house. A man thought to be named Ted Wilson answered the door and allowed them to sing for him in front of the microphone. Impressed with what he heard, he told them that they should stay in town until Monday when his boss would be back so he could hear them and decide whether or not to sign them to a contract. They did eventually make it all the way across town to the Twenty Grand and they asked and were granted permission to get up on stage and sing. And sing they did. So well that people in the audience threw money up on the stage for them. We were just in the right place at the right time. Lou Beatty had written some songs but he didn't have a good group to record them. He had some other people signed on his label like Don Hart and James Shorter, but no real groups. He wanted a group like the Temptations and that's what we were - only better. Now I like the Temptations, they were good, but we could sing circles around the Temptations. Another guy who was at La Beat that really helped us out was Fred Bridges. He worked with us on our harmonies and he encouraged us to write our own songs. But he wrote some good songs for us, too. "A family" was one that Lou had written and when we made that record we sent a copy to President Johnson and we got a letter back from him saying "thank you". It was really something. 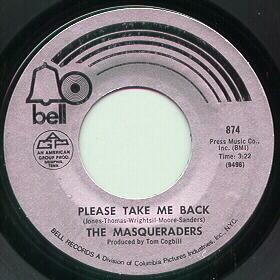 Unfortunately, despite 5 singles on La Beat, none of them were big sellers and the group felt they needed to move on. Robert Wrightsil told me that the decision to move to Memphis was made because that's where the hottest records were being made at that time. They felt that Detroit's hey-day was over - Motown had already branched out to the west coast and would finalize the move the following year, sounding the death-knell of the much-loved and influential Detroit soul sound. Based on advice from their old friend at Soultown, Alvin Howard, they went to Chips Moman's studio down in Tennessee in 1968. I've got to have something to go on. I'm so confused I don't know what to do. Do you love me baby? During this stint with Chips Moman, they also sang background vocals for other artists who recorded at American Studios. In particular, they back-up Alex Chilton on some of the early Box Tops tunes. They also got their first taste of success while in Memphis. 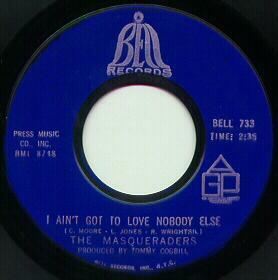 "I ain't got to love nobody else", released on Bell in 1968, was their first hit. And they toured extensively to promote it. In Houston, they appeared on a local TV show with the O'Jays to promote their show - both groups at different clubs on the same night. And they must have impressed the viewers because they broke an attendance record for their gig and no one showed up for the O'Jays! Their next sizable seller, "I'm just an average guy", came out on Chips Moman's own AGP label, climbing to #24 on the R&B chart at the tail end of 1968. It was also at this time that a singer they discovered would benefit from the group's songwriting talents. Sam Hutchins had a versatile voice that the group liked and they incorporated him into their live shows. The backing band would generally open up their shows, then Sam Hutchins would perform, and then the Masqueraders would take the stage and close the shows - often to standing ovations. Around 1969, the group ran into personnel problems and began using Sam as an alternate lead vocalist in place of Lee Jones and sometimes performed as a six-man group. In 1971, they recorded and released "Let me show the world I love you" for their own Stairway label in Dallas, named after the group's previous incarnation as the Stairs. With little promotion, the single and 2 follow-ups went nowhere. 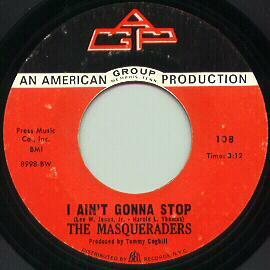 But they still had their awesome sound, and in 1973 they went back to Memphis. They eventually replaced Lee with Sam altogether, and it is Sam's vocal which shines on "Wake up fool" from their brief stint with Willie Mitchell's Hi label. Daryl Carter was their producer on the 3 sides they recorded there. Well, Isaac is a Leo. That's not saying anything bad about him. It's just the way he is. Isaac is more concerned with Isaac than with anyone else. I think we were always too trusting of other people. We didn't know that you had to fight for what you thought you deserved. We didn't know that we should make demands. We just assumed that once we got a deal and made a record, that things would work out. I remember one day Isaac was on the Phil Donahue show. And we thought that would be great exposure for us. But you know what? He never mentioned us. Not a single word about our new album. Nothing. I guess we should have realized then that we should have kept our options open. When I questioned Harold about what looked like a discrepancy in the credits on the label of their Everybody wanna live on LP, he told me: What happened was that there was some miscommunication between me and Isaac's people. That's why my name is not on that record. We had recorded the tracks and I had published them and sent the paperwork to BMI on those songs, but there was a disagreement about Isaac's share of the publishing. Well, I had a friend back in Dallas, Oberdean Deloney - Deano - and since the group knew him, he took my place for a brief period of time. 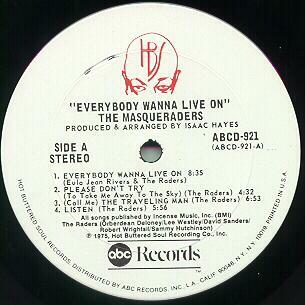 It just so happened that period of time was when "Everybody wanna live on" was coming out. So they made a mistake and put Deano's name on the record, and even though I sang on the record and wrote the songs, I wasn't getting the royalty checks. During this period, the Masqueraders made some performances in Philadelphia, one in particular with an enthusiastic Kenny Gamble in the audience, who came back stage to talk with the group. He invited them to record with him, and they thought that would be a good opportunity for them. Gamble and Huff's work with the O'Jays was all over the charts at the time. But when they approached Isaac about the project, he sent a representative to Philly to talk Kenny Gamble out of the idea. Unbeknownst to the Masqueraders at the time, Isaac Hayes was about to declare bankruptcy and HBS would go belly-up, and he thought letting the Masqueraders go to Philly would mean that one of the few sources of income his label had would cease to be. By the time the label folded, Gamble and Huff had moved on to other projects. When I asked Robert Wrighstil how he felt about it and what he thought would have happened if they'd actually recorded in Philadelphia under the masters of the soul genre in the 70's, he said he was bitter at the time, but thinks that had the group achieved the level of success the way the O'Jays had, the group would never have survived. I would be dead. I would not be here talking to you today. There is no way we would ever have been prepared for that kind of success. I wouldn't have been able to handle it. Even when we did have a little hit like "I ain't got to love nobody else", it was tough. Drugs, women. If we had had more money, we surely would have wasted it and ourselves." After their departure from HBS, the group was without a recording contract until 1980 when they signed with Bang records in Atlanta. 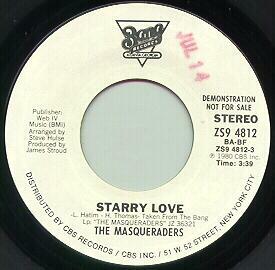 During that period in the late 70's, they continued to perform and record, but nothing was officially released. They performed showcases designed to attract industry attention and gave away cassettes of their then-current (and as of this writing, still unreleased) material. We still have a lot of music in us. We're not over yet. We've recorded a new song last year. And we're not going to stop until we get the Grammy. 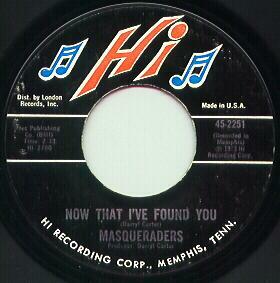 You haven't heard the last of the Masqueraders.